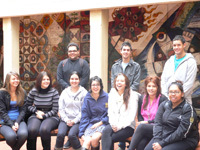 Studying Indigenous Knowledge, History and Heritage and Aboriginal Health and Wellbeing at UWA. All undergraduate students are able to enrol in two majors in Indigenous Knowledge in their undergraduate degree. Students can choose either the major in Indigenous Knowledge, History and Heritage to be offered in Arts or the major In Aboriginal Health And Wellbeing, offered in Science. These two majors will provide students with a very strong grounding in Indigenous knowledge, histories, cultures, rights, ways of working and health. Completion of the either of these majors will prepare students for a wide range of jobs as well as for further studies at postgraduate level.